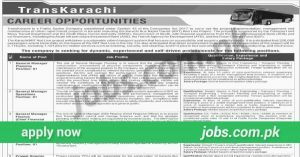 TransKarachi Jobs 2019: TransKarachi is inviting applications from eligible candidates for 14+ Posts (Multiple Categories). TransKarachi is Public Sector Company in Sindh that is set up to carry out the project implementation, management and maintenance of urban rapid transit projects in Karachi including Karachi Bus Rapid Transit (BRT) Red Line Project.Required qualification from a recognized institution, relevant work experience and age limit requirement are as following. Eligible candidates are encouraged to apply to the post in prescribed manner. Incomplete, late, hand written submissions/applications will not be entertained. Only shortlisted candidates will be called for written test/interview. See the notification below to see vacancies/positions available, eligibility criteria and other requirements. Eligible candidates must submit applications on or before 29th April 2019.